General Welfare Clause, Its True Meaning, And How It Should Be Used: It is Foundations of Freedom Thursday, a special day of the week where we get to answer questions from you, the listeners! Tune in today as we answer your questions such as should the 20th Amendment be updated, do we need the government to do our postal roads, and what does general welfare really mean, and so much more, right here on WallBuilders Live! Guests: David Barton and Rick Green. Send in your questions to WallBuildersLive. Constitution Alive Use promo code WBL17 to receive 10% off your entire order! Transcription note: As a courtesy for our listeners’ enjoyment, we are providing a transcription of this podcast. However, as this is transcribed from a live talk show, words and sentence structure were not altered to fit grammatical, written norms in order to preserve the integrity of the actual dialogue between the speakers. Additionally, names may be misspelled or we might use an asterisk to indicate a missing word because of the difficulty in understanding the speaker at times. We apologize in advance. Welcome to the intersection of faith and the culture! It’s Thursday, Foundations of Freedom Thursday. We love them here at WallBuilders, everyday at WallBuilders we’re taking on the tough issues of the day and looking at them from a Biblical, historical, and constitutional perspective. We’re here with David Barton, he’s America’s premier historian. And my name is Rick Green, I’m a former Texas state rep, a national speaker, and author. You can find out more about us at our Web site’s WallBuilders.com, the wealth of information right there at the Web site. Great articles and all kinds of great news of the day as well as great resources for you and your family. Then also WallBuildersLive.com, that’s our radio site. You can get a list of all the stations and you can also get some of the archives over the last few weeks. So if you like these Thursday programs where we dive into those foundational freedoms, answering your questions on those things you can get more of those programs right there on the Web site. Today we’re going to let your questions drive the conversation. David, several questions that we’re going to dive into. This first one is from Mark Tebor it’s actually a part of the Constitution I don’t know that we’ve ever been asked about, the 20th Amendment. David, we talked about this with Constitution Alive, it basically was trying to get rid of a lame duck Congress, make that a shorter time period from election to when they actually get into office. But these days, two months is a pretty long time still. And the Constitution under the 20th Amendment shifted things. It used to be that the president was inaugurated in March and then it moved the inauguration up to about the 20th of January. It used to be that the new Congress came in also in the spring but the 20th Amendment said, “No, the new Congress takes effect on the 3rd of January.” So what you’re looking at is that period from the first week of November until essentially the first week of January, you’re looking at two months. Well, it used to be four months before that. So lame duck Congresses do have a lot of problems. There were several situations where that having a lame duck Congress wasn’t a good deal. For example- and this was changed in 1933 is when this amendment went in. Because at the time you had the great depression going on. The great depression, you elect a president of the United States but he doesn’t get to take office for four months. Well, there’s a lot of stuff going on at that period of time that we would sure like to have dealt with. So the belief was we’ve got to be able to move a lot faster on this. The same with Abraham Lincoln, you’ve got a civil war facing you. Well, he gets elected but is four months before he takes office. That’s four months that the nation is without any kind of significant leadership be able to deal with, or try to avert, or anything else, a civil war. So as those kind of crisis came out it was a real problem. By the way, the lame duck thing, here is an example of how the lame duck was used politically. Lame ducks are always used by parties to try to get through what they want. The great example is the election of 18 hundred. You had a massive seismic shift in the United States in the electoral view of what they wanted in Congress and in the national leadership. The election that year was probably the most vicious presidential election in American history between John Adams and Thomas Jefferson in the election of 18 hundred. Just the names of the parties is enough to tell you how vicious it was. John Adams headed the Federalist Party. Well, Jefferson heads the other party. And what’s the name of the other party? The anti federalist party. It’s real simple, whatever you’re for we are against, anything, we’re polarized. So, if you’re a federalist we’re anti-federalist. If you think the sun comes up in the east and goes down to the west we think it comes up the west goes down in the east. It was that kind of stuff and that’s why I was such a vicious campaign. The attacks leveled particularly against Jefferson, they were really vicious. The Federalists were a lot meaner than the Anti-Federalists were. So there were attacks leveled against John Adams who were unjust. But particularly against Jefferson were unjustly. He was accused of things that are just absolutely historically false. So there’s a seismic shift, the people chose an Anti-federalists, President Thomas Jefferson, they chose an Anti-federalists Senate, and they chosen Anti-federalists house. Well, it had all been Federalist. Now with one election you’ve lost everything and in the federal government. So they came up with all these things. And because the Constitution allows Congress to control D.C they also said, “We’re going to create a bunch of judgeships in D.C., and justice of the peace, etc. And they did that and they went through and loaded them up with federalists. That was a lame duck Congress. Four months to work on something with no accountability for what you were about to do. With no accountability. And knowing that the people have already rejected you. So you no longer feel accountable to the people so I’m going to go way overboard on this. But we also know that that’s not necessarily fixed by having an even shorter time. If we had the election on a Tuesday and the next Monday the president were inaugurated, with the technology we have today in those intervening five days the president would write 847 executive orders, the regulatory branch or to create 43,000 new federal laws, I mean, that’s the same kind of thing that we saw happening when Obama went out. The number of executive orders, number of pardons he issued, the number of whatever. So even in that two month period of time you didn’t have the Republican Congress do a lame duck kind of stuff. They kind of sat on it. But you had the president going out before Trump could come in just issuing all these orders. So I don’t even think that it’s a matter of how short the time is. It’s a matter of the character of the people you have in there. With technology as it is today, even if it was 24 hour turnover, I guarantee you they could still get a lot of agenda done in a 24 hour a lame duck session of Congress. Yeah, they’d have it planned ahead and ready to execute in that short period. You bet they would. It’s the nature of man. So you’re dealing with nature man more than you are the Constitution. But that’s the 20th Amendment and a lame duck session of Congress really is bad, period. It was supposed to be so you could deal with the impending crisis not change the entire direction of the nation before the next guy came in. No doubt no doubt. Quick break, we’ve got some more questions coming from the audience when we return. You’re listening to WallBuilders Live. This is Tim Barton from WallBuilders with another moment from American history. Many today assert that religion is something private, that has no place in the public square, and that it is incompatible with government. And signer of the declaration, Benjamin Rush, similarly affirmed, “Without religion there can be no virtue and without virtue there can be no liberty and liberty is the object and life of all Republican governments.” The Founding Fathers understood that limited government required public morality from the people. And that public morality was produced by the Christian religion. For more information about the Founding Fathers views on religion in public life go to WallBuilders.com. Welcome back to WallBuilders Live Foundations of Freedom Thursday, today. That’s the day of the week that we take your questions and we let you drive the conversation. We had our first question on the 25th Amendment of the Constitution. Next question comes out of Article 1 of the Constitution. It’s from Alex he said, “Donald Trump has talked at length about the need to rebuild the nation’s infrastructure primarily the roads, bridges, railroads, etc. In Article 1 of the Constitution Congress is given the power to establish post offices and post roads. What other responsibilities in this matter are assigned to the Federal Government?” David? The post roads and post offices is about the only way you can justify having the federal government involved in transportation across the entire nation. The federal government was required to be able to provide post roads so that you could deliver mail across the nation and keep the communications going across the nation. Then you have the road situation because you need to be able connect all those post offices and that’s why Eisenhower comes in and he does the interstate highway system that allows you to get mail all across the country. The situation is very different today where you can do things electronically and you don’t necessarily need all those roads and all those post roads. That’s not the issue. We do it with airplanes and everything else. So you could probably make a better argument for having the federal government work on airports because that’s how you keep the mail moving more so than on highways right now. It’s kind of ambiguous in the sense that you can kind of justify a highway system because of the post roads because you have to keep that open. But when you look at other associated responsibilities specifically for that there’s not much in the way of infrastructure. Specifically when you look at what the Constitution says the federal government can do. You look in the Constitution and you find that there’s only 15 enumerated powers belonging to the federal government, only 15 things. Of course the 13th, 14th, and 15th amendment added two more responsibilities. You can say there’s 17 things that the federal government has authorized by the Constitution to do. The Tenth Amendment basically says if it’s not one of those 17 enumerated powers it belongs to the states. Federal government is not supposed to be doing that. So that’s one power, the Congress shall have power to pay the debts and provide for the common defense and general welfare of the United States. So that’s another. But it does say that all duties, imposts, and excises, shall be uniform throughout the United States. Here’s the third one, congress shall have the power to borrow money on the credit of the United States. Fourth one, Congress shall have the power to regulate commerce with foreign nations and among the several States and with the Indian tribes. You keep going through and there’s pretty simple stuff listed here, pretty easy to understand. It doesn’t take a Supreme Court to interpret this. There’s these 15 or so powers, 17 with the 13th to the 15th Amendments, and that’s what Congress is supposed to be working on. So, there’s just not much there other than post roads that would really authorize infrastructure repairs and etc. And in reality, let’s think about if they didn’t do it. You say, “Well, what would the states do? Then you just have highways connected and across state lines that states responsible for it, right? It would be like it was back in the 60’s before the feds really got involved in infrastructure even though you had the interstate highway system. It was when you got to the state line between Texas and Arkansas you started driving in potholes once you get to Arkansas. Clearly, the quality of roads has gone up because of the federal taxes. But at the same time it is a real difficulty for a lot of states, as Rick Perry pointed out, for every dollar of transportation taxes we send to DC. Texas only gets 60 cents back on the dollar. No doubt, and you could have more of a market driven- Look, if you’ve got lousy roads, people aren’t going to visit your state as much. It will cost you in the long. That’s what Perry did at one point, he just withheld the transportation fund and said, “Look, we’ll just keep them here that way we can get 100 percent of what we collect.” So whatever is being collected for federal transportation taxes, let’s just keep it in Texas and spend it there. So if you want to collect the taxes on it, ok, but we’re going to keep that money in Texas, or in Arkansas, or wherever it is. What really changed the highways in Arkansas was when Bill Clinton became president and then suddenly every highway in his home state had money and they were building highways like crazy and bridges. Well, that’s not really the way it’s supposed to work either, giving all the perks to your home state. So, other than the fact if it did not say post roads there would be no debate that there is no authorization for the federal government to do infrastructure. But because it does say post roads and because you do have to have a national communications system then that does bring in- it’s not enumerated powers, it’s implied power. That’s the other kind of powers that implies the power to be able to do that. So you could argue that trains are part of that national communication system, certainly airports, and you could say highways, and therefore bridges, and what goes with highways. That’s not enumerated but that’s probably implied. But past that it’s a real stretch to start saying, “Well, it’s a general welfare that allows us to do this. No, not really. Speaking of General Welfare, we’ve got another question on that. We’ve got to take a quick break, we’ll be right back. Question on general welfare coming from Stephen Patrick, stay with us you’re listening to WallBuilders Live. I want to give you some websites today that can help you accomplish that very thing. If you get online you can go to places like Library of Congress and you can look under their century of lawmaking or historical documents. You can go to the Avalon Project, to the Founders Constitution, Google Books, or even the internet archives. Or you can just go to WallBuilders.com. We have a section for our WallBuilders Library. And under that section we have different subgroups for historical documents, historical writings, even a place where you can get helpful links to find out more information about other websites. Where you can do research for yourself and find the truth for yourself. Friends, this is the time that we need to know who we are and where we came from. WallBuilders.com is a great place to go. Welcome back to WallBuilders Live on this Foundations of Freedom Thursday. We’ve been covering several constitutional questions today. You can send your questions into [email protected]. So far we’ve talked about the 20th Amendment, Article 1 Section 8. I’ve never heard anybody put it that way. He’s right, it’s like a wild card. I don’t have four queens but I’ve got three queens and a wild, here’s my wild card, I’m going to get this legislation done through the general welfare clause even though it’s not constitutional. I’ve got this big umbrella I can put it under. And it has become sort of a major loophole that a lot of legislation has been pushed through. So it says that the Congress shall have power to provide for the common defense. No, I think what it really means is that Congress shall have power to generally provide welfare. If you’re a wordsmith you can come up with all kinds of things. It’s all the same words whether it’s general welfare or generally provide welfare, it’s the same thing. Wait, you’re saying it doesn’t matter what the intent of the people that wrote it was, however, we could twist them around like a Sesame Street. They specifically took pains to define what they meant by General Welfare. Basically it means if you do the 15 things that we’ve told you you can do in the constitution that will provide for the general welfare of the United States. Those are things that will generally improve the condition that it states, that it’s the general welfare, do the 15 things we said you could do. Matter of fact, you’ve got some good quotes that you’ve pulled up. So that really meant in a general welfare of the country, not individual welfare. That’s right. It was not social programs because that was not the business of government to provide social programs, especially the federal government. You could argue the states might could or cities might could but the federal government sure as heck could not. In fact, you said Hamilton had a very specific quote on that because it was this idea of should the federal government be involved in the general welfare, meaning protecting the whole nation. Which actually even that language you quoted the Constitution was literally about paying off the debt when you have to go to war. So if you’re going to protect the general welfare of the nation you’re going to end up having to pay for that war in order to do that. And that’s a proper role of the government. So he’s saying in today’s language that your congressman, if he comes home and says, “I’m going to get you a million bucks for the local library.” That’s a local nature, that should not be a federal expenditure. If he says, “Hey, I’m going to make sure that we pay for the B-1 bomber or we pay for something is going to protect the whole country.” That’s a general nature. “We’re going to build a wall there to protect the border of the country.” That’s General nature, that’s not local nature. And what he really nailed there without using our terms is that you can’t have earmarks. Because that’s a local nature, earmarks are always a local nature to help the local industry, or this local business, or whatever it is, that’s an earmark. He said, “Not that. It’s got to help all the states, not just one.” And there’s an argument, “Well, if you help one state that helps the entire economy. As a matter of fact, at the break. Let’s come back and talk about how the Founding Fathers talked about that helping the economy of one state is not helping the economy of all the states, that’s not the general welfare clause that they talked about. Stay with us folks, more on the general welfare clause of the Constitution when we return here on WallBuilders Live. Welcome back to WallBuilders Foundations of Freedom Thursday, today. Taking your questions and if you’ve got one right now you’re thinking to get on your computer and write it out to us, [email protected]. David, you’ve been answering this general welfare question. You’ve just about to tell us before we went to the break about what the Founders said about when we would go in and try to help the welfare of one particular state, why that wasn’t actually good for the whole nation. In 1792 there was what was called the cod fish debate. Massachusetts is one of the most populous states in the United States. It is one of the big engines that drives the economy of the United States. The number one industry in Massachusetts was fishing, hands down. But something a plague of sorts hit the fishing industry Massachusetts. Codfish is the biggest thing they had. This plague, I don’t know if you call it the Red Tide, or whatever you call it. Red tide goes in and kills all the fish and all the living stuff. It came in and wiped out the codfish industry. So with the codfish industry being gone, man, that’s a huge chunk of the economy. And so the question in Congress was should Congress step in and bail out the codfish industry? In other words, is there a private business that too big to fail. Should Congress bail out private business too big to fail. And the argument was if we could help the economy in Massachusetts that will help the entire United States because if the Massachusetts economy goes under it’s probably going to hurt the country. He says, “If you take that view of the general welfare clause, if you let the federal government bailout a private business that is too big to fail, the codfish. If you take that view the next thing you know the federal government is going to start getting involved in education, they’ll get involved in police powers, they’ll get involved in transportation.” And you go, yeah they did. They used the general welfare clause. And people sometimes call that the elastic clause because it is elastic. Anything can be called the general welfare. If I pay myself more money in my job that’s going to generally help the welfare because I’ll generate more income which means I pay more taxes which helps everybody. Anything can be justified to general welfare. So Madison said, “You can’t do that. The general welfare is when you do the 15 things the Constitution says you should do.” That’s the quote you heard from Hamilton. That’s what the general welfare is. You know, David, I’m a bit of a country boy. But even I can understand what Madison said. The Constitution is a limited one possessing no power, not actually given. I mean that’s pretty plain. If we didn’t tell them they could do it they shouldn’t be taking these phrases and blowing them out of proportion to do all these things we never gave them the power to do. And notice that everything they do for the general welfare gives them more power more control over our lives. And that’s the other thing, “We’re doing this for you. Give us more power over your life. It’s all for your good.” No, I kind of like freedom more than I like you controlling my life. Especially, you may have a good intent but five years from now, 10 years from now, 15 years from now, the same guy may take that power that I’ve given you and use it for something wrong. So I’m just going to hold that power back. And that’s what the Founders recommended about not using the general welfare clause for broad issues. It starts with us getting educated we’ve got to know what those phrases mean and what the truth is about the Constitution then we’ll make better decisions when we’re electing folks. Even some of our listeners will be the ones to get elected. So get started, study the Constitution. We’ll have a link today to make it easy for you, you can find out more about Constitution alive and make it a home study or even in your Sunday school class. 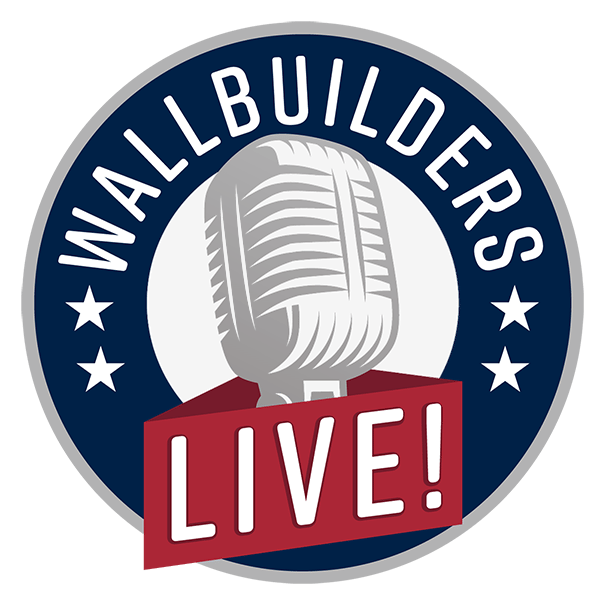 Thanks for listening today to WallBuilders Live!